Listen to "Effective Communication from Basketball to Business w/ Alan Stein Jr. | BostonSpeaks 017" on Spreaker. The principles of effective communication in basketball are identical to the principles of effective communication in business - communicate clearly, communicate consistently and communicate intentionally. 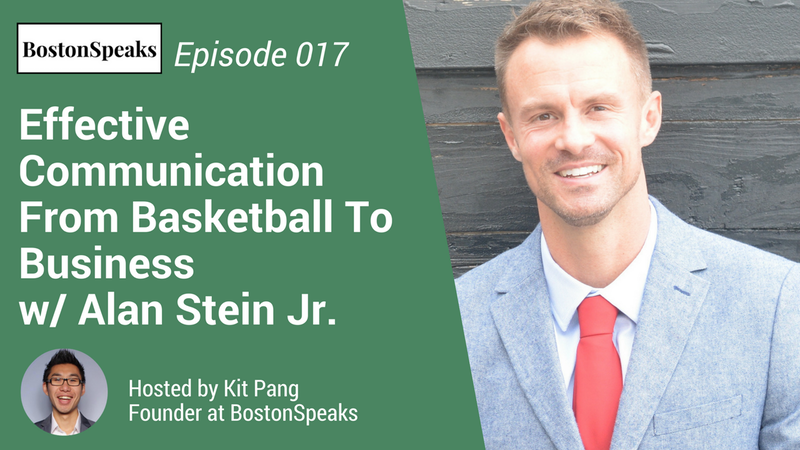 In this interview, we'll learn about Alan Stein, Jr.'s experiences working with some of the highest performing basketball players and how you can apply these lessons to how you communicate as a leader. Criticism Leading is not what you say. It's what you accept. Who is Alan Stein, Jr.? Alan Stein, Jr. - What makes the BEST the BEST? The mindset, rituals and routines they have during unseen hours. Alan Stein, Jr. knows what those are and will teach you to apply them to your company culture. Alan has spent the past 15 years working with the highest performing basketball players on the planet, including NBA superstar Kevin Durant. He now teaches organizations how to utilize the same strategies in business that elite basketball teams use to perform at a world-class level. He is passionate about developing genuine leadership, authentic team cohesion and true mental toughness as well as proving that the principles of achievement on the court are identical to the principles necessary to achieve in any industry. Alan’s goal is to educate and inspire the audience to take immediate action to improve their mentality, habits and maximize their contribution to their team.